Are you planning to schedule your staff to respond to after-hours support requests? It is now possible with 3CX On Call Manager. A web portal allows you to manage schedules and respond to requests. 1.1. Why On Call Manager? 3CX On Call Manager relieves you from the trouble of taking care of your customer requests for help when your support staff is not working. 3CX On Call Manager seamlessly integrates with 3CX and makes automated notifications easy while enabling you to provide better service to your customers. 1.2. How does it work? 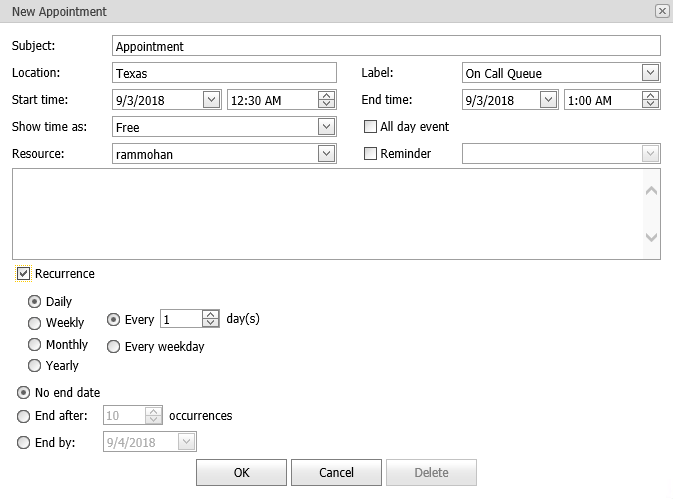 When your customers are sent to a support queue, 3CX On Call Manager will search a calendar to see who is scheduled to handle after-hours support calls. The software logs your scheduled agents into the queue automatically. If the max queue hold time is exceeded, the caller will be asked to leave a voicemail. 3CX On Call Manager will automatically notify your staff that there is an open support request. In addition to calling your staff on the phone, the program can send text messages, and emails with a copy of the customer’s voicemail for your staff to hear, along with a text transcription of the voicemail. 1.3. How does it notify you? 3CX On Call Manager provides multiple levels of notification. You can configure how staff are notified, how many times you want 3CX On Call Manager to notify an employee, and how long to wait between notifications. If an agent doesn’t respond, 3CX On Call Manager will escalate notifications to the next agent. A web portal makes it easy for you to set up staff preferences, administer the schedule, review a log of support requests and notifications, and update the status of the support requests. Having an event log makes it easy to track after-hours support requests, monitor compliance with service level agreements and track staff performance. 3CX On Call Manager makes sure you are notified of support requests and helps you provide timely responses to those requests. It ensures quick responses to help requests and thus improves your customer service. 1.4. How to use On Call Manager? 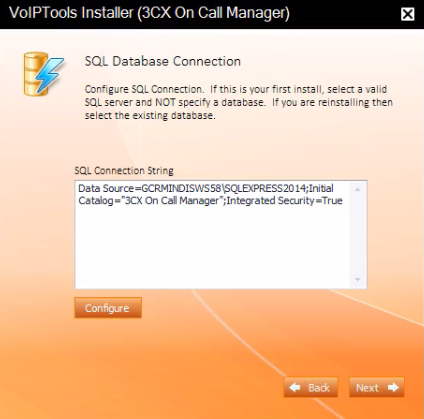 3CX On Call Manager Standard is a onetime installation process. Once you install it, the product will automate the call management according to the settings that you configure in the web portal. 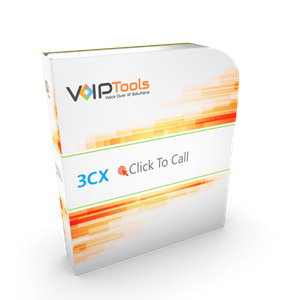 You can order 3CX On Call Manager Standard on-line at http://www.voiptools.com. Your order confirmation email will include your license key and a link to download the software. There are a number of prerequisites that must be installed prior to installing 3CX On Call Manager Standard. These prerequisites include Microsoft Internet Information Server (IIS) and Microsoft SQL Server. You must register your license key to activate 3CX On Call Manager Standard. Your license key is included in your order confirmation email, and can also be found in your order history on our website. The following section guides you through a detailed walk-through of the installation process. You can check for the software download link included in your order confirmation email. As an alternative, you can also find the link from your order history on our website. The file you downloaded in the above step is a compressed .zip file. 1. Position the mouse on the zip file and right-click. 2. Double-click the file to start the VoIPTools Setup Wizard. 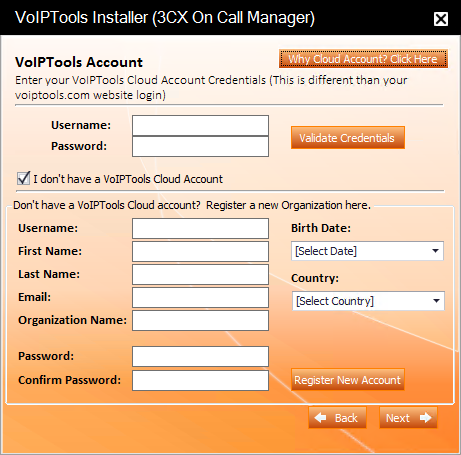 Enter VoIPTools Cloud Account Credentials. This is different than you voiptools.com website login. VoIPTools products are moving to a long term strategy of leveraging the cloud. Eventually, you will no longer need a firewall configuration to use our relay. But in addition to that, some of the features of our products have started interfacing with the VoIPTools cloud infrastructure, and thus require a cloud account to be installed on the machine with the associated product. For example, Voicemail Manager leverages the cloud to perform Voicemail transcriptions. Simply create your account, and then enter the credentials to move forward with the installation. a. 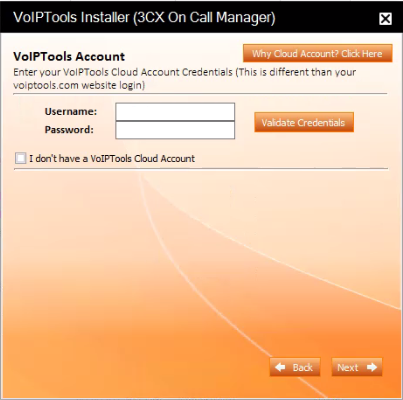 Enter the valid VoIPTools Cloud Account credentials in the Username and Password fields. b.	Click Validate Credentials button to validate the account. Success message box appears and click OK.
c.	Click Next to move forward with the installation. a. Check the I don’t have a VoIPTools Cloud Account check box. VoIPTools Account login screen expands and provisions you to create and register a new cloud account. b. In the Username field, enter the username with which you will be logging into the VoIPTools Cloud Account. c.	In the First Name and Last Name fields, enter your first name and last name respectively. d.	In the Email field, enter valid email address for communication. e.	In the Organization Name, enter your organization name. f.	From the Birth Date calendar control, select your date of birth. g.	From the Country dropdown, select your country. h.	In the Password field, enter the password for your VoIPTools Cloud Account. i. In the Confirm Password field, re-enter your password to confirm. j.	Click Register New Account button. Registration Success message box appears. k.	Now enter the login credentials you have just registered in the VoIPTools Account login screen and click Validate Credentials to validate your account. l.	Click Next to move forward with the installation. 3CX permits one 3rd party application to communicate with the 3CX server at a time. To overcome this limitation, VoIPTools created the 3CX Relay Service. The Relay is a lightweight application that is installed directly on the 3CX server. The Relay exposes the 3CX Call Control API (and other VoIPTools services) to all our applications, and manages requests and events between VoIPTools products and 3CX. The Relay also makes it possible to install our VoIPTools products on a remote server (including over the internet). 1. If you have not previously installed the Relay on your 3CX Server, you can download the Relay installer by clicking on the Download Relay button. The Relay must be installed directly on the 3CX server. 2. If you are installing 3CX On Call Manager Standard directly on the 3CX server, you can install the Relay simply by clicking the Install/ Upgrade Relay button and following the Relay install instructions. If you have already installed the Relay, you need not install it again unless a newer version is required. 1. 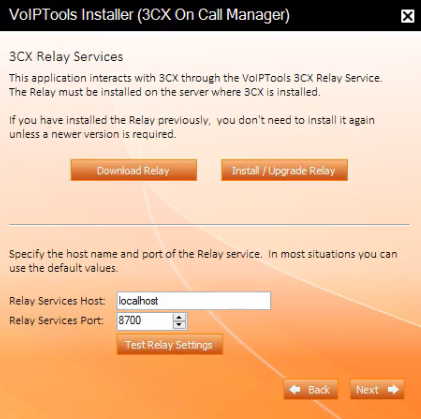 In the Relay Services Host field, enter “localhost” if installing 3CX On Call Manager Standard on the 3CX server. If 3CX resides on a different server, enter the IP address or FQDN of the 3CX server. The default port number is 8700. 3. Click Test Relay Settings to confirm 3CX On Call Manager Standard can communicate with the Relay services running on the 3CX server. 4. Click Next to continue the installation. If this is your first install then, select a valid SQL server and if you are reinstalling then select the existing database. 1. When prompted for the database connection information, click Configure. 2. In the Connection Properties dialog box, enter the SQL server name. If using the free SQL Express edition, the default SQL Instance name is <your-server-name>\SQLExpress. 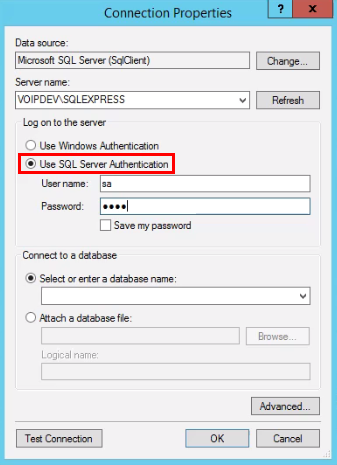 If you want to use ‘SQL Authentication’, then install SQL Server in ‘Mixed‘ mode. 3. Enter the login credentials. a. If using Windows integrated security, select Use Windows Authentication. The VoIPTools installer will create a local windows user name as “VoIPToys” and will give sufficient rights to this user to create / update the SQL database. b. 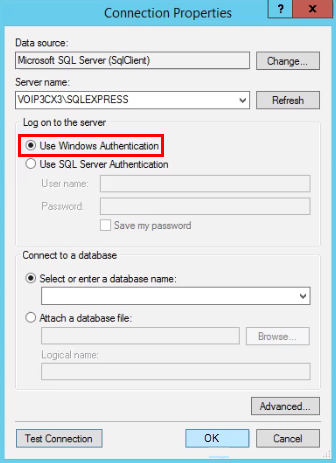 If SQL Server authentication is desired, select Use SQL Server Authentication. 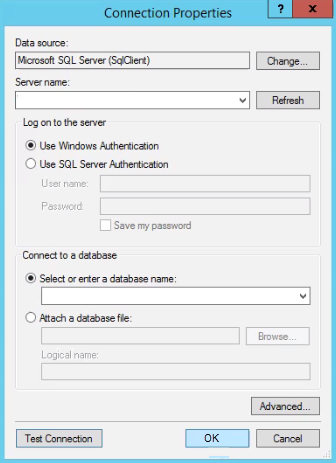 Be sure to select a SQL Login that has sufficient permissions to alter the database and create SQL objects. Enter the User name and Password, and select appropriate database value from the Select or enter a database name drop down. 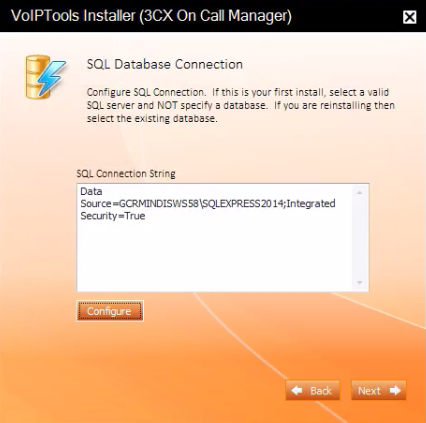 The first time you install 3CX On Call Manager Standard, DO NOT enter a database name. Choose Select or enter a database name and leave the database name blank. The installer will create the SQL database automatically and apply the necessary permissions. If upgrading 3CX On Call Manager Standard from a previous version, select the existing database from the list. The On Call Manager Configuration screen enables you to configure voicemail path and windows authentication. 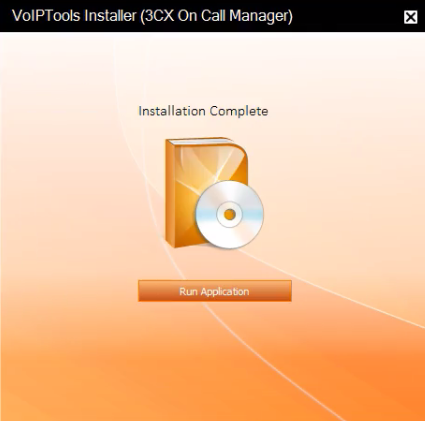 Use the default path if installing 3CX On Call Manager directly on the 3CX Server. If installing on a server other than the 3CX server, you will need to share the voicemail folder (for example: \\server-name>\share-name) and provide login credentials to access the shared folder. If 3CX and ‘3CX On Call Manager Standard’ are installed on the same server, you do not need to enter any credentials. 1. 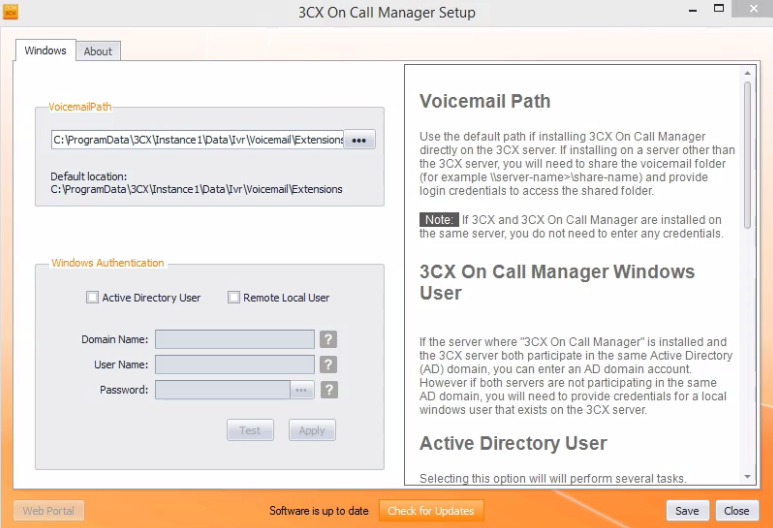 In the 3CX On Call Manager Setup dialog box, browse the voicemail path. If the server where “3CX On Call Manager” is installed and the 3CX server both participate in the same Active Directory (AD) domain, you can enter an AD domain account. However, if both servers are not participating in the same AD domain, you will need to provide credentials for a local windows user that exists on the 3CX server. a. Change the 3CX On Call Manager IIS Application Pool login user. b. Recycle the IIS Application Pool and Website. c.	Change the 3CX On Call Manager Windows Service login user. d.	Grant the user “Login as a service right”. e.	Restart the 3CX On Call Manager service. If you check Remote Local User box, a “Net Use” command connects to the remote shared folder using the supplied credentials of a local user that exists on the 3CX server. Unlike the “Active Directory User” option, this option will NOT make changes to the 3CX On Call Manager Windows service account or change the IIS application pool authentication. To access the ‘3CX On Call Manager Standard’ web portal, click the Web Portal button on the configuration program, or click on the desktop icon that was created during the installation process (‘3CX On Call Manager Standard’ Web). When connecting to the web portal, you will be asked to provide login credentials. 1. In the Extension field, enter your 3CX extension number. 2. In the PIN field, enter your 3CX Voicemail PIN. 3. Click Login button to login to your account. Registration is required to authorize your license key. Registering also makes it possible for VoIPTools to provide a replacement key if your license key is ever lost. Also, it enables VoIPTools to notify you of any product updates, and reminders if your key is reaching the renewal date. 1. On the Settings menu, and in the License tab, enter your registration information in all the fields (Note the red dot denotes a required field). The license key permits you to install the software on one computer. This is not free software. The General Settings enable you to register the software, configure notifications, monitor queues and voicemails, control who can access configuration screens, configure email server, and configure voicemail to text transcription. The General screen enables you to configure Notification settings and start/stop 3CX On Call Manager Windows Service. a. Under Notifications, from the Contact Attempts box, select or type the number of contact attempts. b. From the Time between attempts box, select or type the time (in minutes) you want 3CX On Call Manager to wait between the ‘contact attempts’. d.	Click Save to save the changes. 3CX On Call Manager supports up to 99 escalation levels. The number of times you want the 3CX On Call Manager to attempt to contact a person before escalating to the next level. The time (in minutes) for which you want 3CX On Call Manager to wait between notification attempts. Number of escalation levels you want 3CX On Call Manager to escalate. If the first level does not respond by listening to the voicemail, after the maximum call attempts, it escalates up to the next level until the max escalation level has been reached. Entering a maximum escalation level will limit the number of levels 3CX On Call Manager attempts to contact and make the application run more efficiently. a. To start or stop a service, click Start/ Stop button. b.	Click Refresh link to update the status if changes to the service status were made directly in the Windows Service Snap-in. If the service status is “Unknown”, this is typically caused by the 3CX On Call Manager IIS Application Pool user having insufficient rights. A Windows Service (3CX On Call Manager) runs in the background monitoring for new voicemails. You can monitor the status of this service here (Running, Stopped, Unknown). If you make changes to the Contact Attempts, or Time between attempts settings it is necessary to stop and start the service. This should happen automatically when you press the Save button. The ‘Refresh’ link will update the status if changes to the service status were made directly in the Windows Service Snap-in. 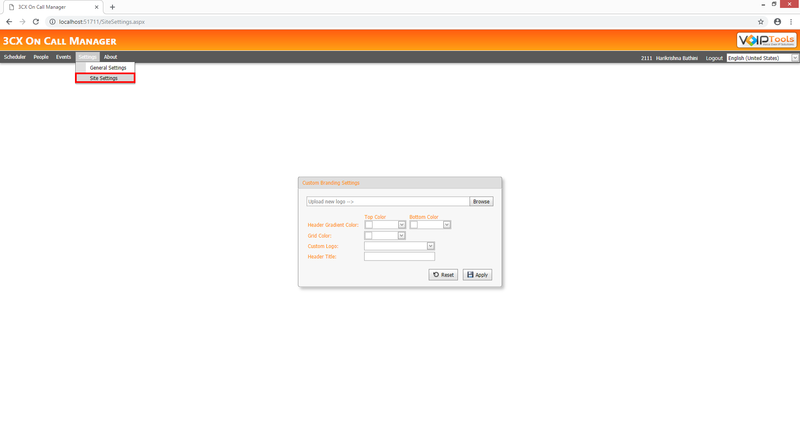 From Monitor screen, you can configure Notification Digital Receptionists, Queue Monitor and Voicemail Monitor settings. a. 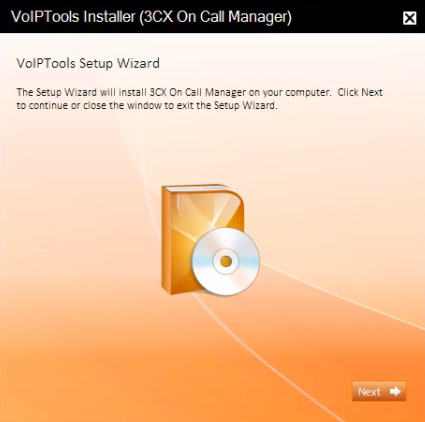 New: When a new on call voicemail is received, 3CX On Call Manager will call (if configured to do so) the scheduled employee(s) and connect them to the digital receptionist. This digital receptionist’s recording typically explains that a request has been received, and then automatically transfers the scheduled employee to the 3CX Voicemail Exten sion (999 for example). The employee will need to login to the on call voicemail box that you have configured, in order to listen to the voicemail. To provide complete flexibility, the install program does not automatically create the Call Queue. However, some common settings might include setting the timeout to 0 and having the action set to connect to the voicemail extension. b. Heard: After a monitored voicemail has been heard, assuming you selected to be notified by phone, 3CX On Call Manager will call all the people previously notified to let them know the voicemail has been heard. This Digital Receptionist typically plays a recording that explained the message has been heard and then hangs up. The standard edition of 3CX On Call Manager can monitor a single “1st Level” call queue. If enabled, staff scheduled for “Level 1” will be logged automatically into, or out of, the monitored queue according to the configured schedule. 3CX On Call Manager uses a Call Flow Design (CFD) application to log staff into the “1st Level” queue automatically PRIOR to transferring the caller to the queue. As a result, if using a 1st level queue, you MUST route calls to the CFD Call Queues that was created by the installer. The CFD will transfer the caller to the appropriate queue. The CFD Call Queues is named “OnCallManager” by default. A typical configuration routes a caller first to a standard Digital Receptionist that prompts the caller to select Technical Support from a list of options. When the support option is selected, rather than routing the caller directly to the 1st level queue, it should route the caller to the CFD Call Queues. The standard edition of 3CX On Call Manager monitors a single voicemail box for new voicemails. Enter the extension number that will receive on call requests. The Managers screen enables you to control who can access the configuration screens by assigning ‘Manager’ role to one or more extensions. a. In the Settings screen click Managers tab. b. Under Managers section and from the list of available extensions, check all the check boxes whom you want to assign the ‘Manager’ role. If you do not wish to restrict who has access to the configuration screens, simply leave all extensions unchecked and everyone will have access to the configuration screens. The Email screen enables you to configure Email Server and Authentication. a. In the Email tab, under Email Server section and in the Server field, enter IP address or ‘Fully Qualified Domain Name’ (FQDN) of your email server. c.	In the From Email field, enter reply email address for email and SMS text notifications. d.	In the To Email field, enter valid test email address. e.	Check Attach Voicemail to email box to attach the voicemail to the specified email. The reply email address for email and SMS text notifications. Be sure to test both an email address and SMS text message. VoIPTools suggests you to test each mail, distribution, or SMS address to ensure you can send to all addresses. Sending mail within your domain may not require authentication, while sending outside your domain (SMS address for example) may require authentication. The domain for sending SMS text messages is specific to the wireless carrier. This is a temporary valid test email address that is only used for sending test emails and is NOT required. Some mail servers require authentication to relay emails. a. Under Authentication section, in the User field, enter valid username. For Microsoft Exchange, use a Windows domain (network) username. b. In the Password field, enter valid password. c.	Check Requires SSL/ TLS box if your server requires a secure connection to relay email. d.	Click Test button to test whether your SMTP settings are correct. (For this, you need to enter a valid email address in the To Email field and press Test button). Your mail server may require a secure connection. – Secure Socket Layer (SSL) or Transport Layer Security (TLS) to relay email. Gmail, Google Apps, and Microsoft 365 require a secure connection. You can test whether your SMTP settings are correct by entering an email address in the ‘To Email’ field and pressing the ‘Test’ button. The Transcript screen performs voicemail to text transcription. The accuracy of voice recognition can be greatly affected by a number of factors. For example, the quality of the recording, background noise, volume of the speaker, and the speech patterns of the speaker can all have a significant impact on the accuracy of the transcription. 3CX On Call Manager sends voice transcriptions to VoIPTools servers where we process the audio based on various providers on the back end. 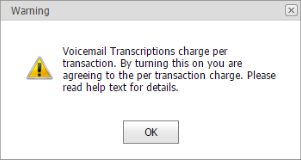 VoIPTools does not keep a copy of your voicemail or the transcribed text, but will only record that a transcription has happened for billing purposes. VoIPTools charges as per transcription fee. The current rate, which is subject to change, is $0.15 per transcription. There is no charge for blank transcriptions or failed requests. VoIPTools Speech Transcriptions will transcribe a full 2 minute voicemail. You must have accepted our billing agreement to use this service. a. In the Transcript tab, check Speech Transcriptions check box. Warning message appears. b.	Click OK to enable ‘Speech Transcription’. c.	From the Culture dropdown, select appropriate option. The default option is English-US. d.	Check Remove offensive words from transcription check box if you want to remove offensive words from transcription. Info message box appears. 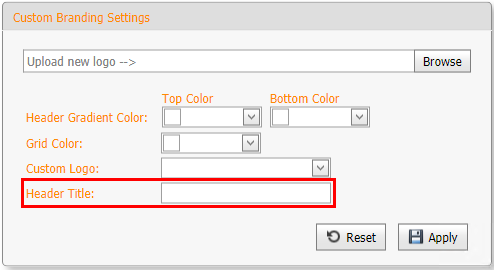 i. Beside Header Gradient Color and from the Top Color palette, select the desired color that you want to display as the top color for the ‘Application Title Header’. ii. 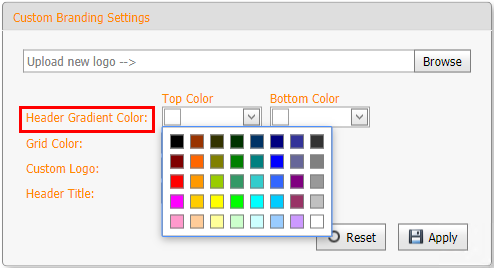 From the Bottom Color palette, select the desired color that you want to display at the bottom of the ‘Application Title Header’ in gradient to the selected Top Color. i. 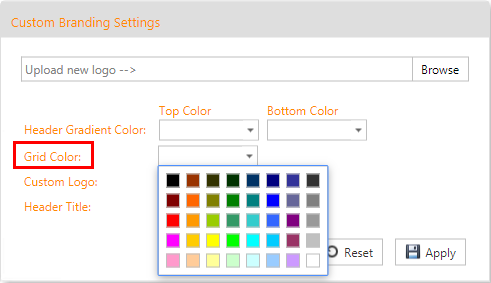 From the Grid Color palette, select the color that you want to display for the grid in screens that display grid data. the logo is added to the Custom Logo drop down list. ii. From the Custom Logo drop down list, select the logo that you have just uploaded. i. In the Header Title field, enter the text that you want the application to display as ‘prefix’ for the existing title in application header. 3. Once you perform desired customizations, click Apply. The People screen enables you to manage people. You can create, delete or update people. Here, you can set one or more type of notifications (Call, Email, SMS) for the scheduled people at different escalation levels. • Contact notifications are those that notify a person about how the call is received. • Update notifications are those that notify a person about every update on the call. 1. In the People screen, click on the left hand side of the column header. 2. In the Ext field, enter the extension number for the new agent. 3. In the Name field, enter the name of the agent. 4. In the Cell field, enter the mobile number of the agent to send notifications through ‘Call’. 5. In the Email field, enter the email address of the agent to send notifications through email. 6. In the SMS Address field, enter the agent’s mobile number if you want to send SMS text (notification) to the mobile number, or enter the agent’s email address if you want to send the SMS text (notification) through email. 7. In the Contact section, check one or more of the available types of notifications that you want to use to notify the agent. 8. In the Update section, check one or more of the available types of notifications that you want to use to notify the updates on notifications to the agent. 9. Click Save to save the new agent. The Scheduler screen enables you to control visible resource count, view resource appointments for a specific date and in desired calendar format, create new appointments and edit/ delete existing appointments. 1. The ‘Visible Resource’ buttons enable you to select and view one or more resources on the ‘Scheduler’. 3. On the right hand side of the ‘Calendar’ header, you can select appropriate tab to view the scheduled appointments of the visible resources in various calendar formats like Day, Work Week, Week, Month or Timeline. a. Day tab displays all the visible resource appointments for a specific date in day format. b. Work Week tab displays all the visible resource appointments in work week (Monday-Friday) format. c.	Week tab displays all the visible resource appointments in a week (Sunday-Saturday) format. d.	Month tab displays all the visible resource appointments in a month format. 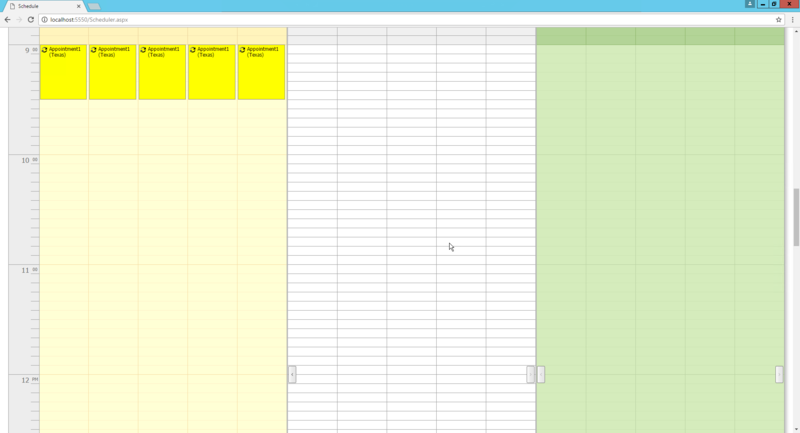 e.	Timeline tab displays all the visible resource appointments in a timeline format. 4. The colors of the appointments are different at each escalation level. 5. The ‘Right Click’ menu is a context menu that enables you to create new appointment for any agent. To view the menu, right click your mouse in the scheduler grid of the desired resource by positioning the mouse in the appropriate cell that matches your required date and time. For field definitions, click here. 6. From the ‘Right-Click’ menu, you can select 60 Minutes to view the Scheduler screen that divides the grid to show time interval in terms of 60 minutes. Similarly, you can view the grid in other time divisions like 30 minutes, 15 minutes, 10 minutes, 6 minutes or 5 minutes. 7. Right-Click on appointment to open and edit the selected appointment. For field definitions, click here. 1. 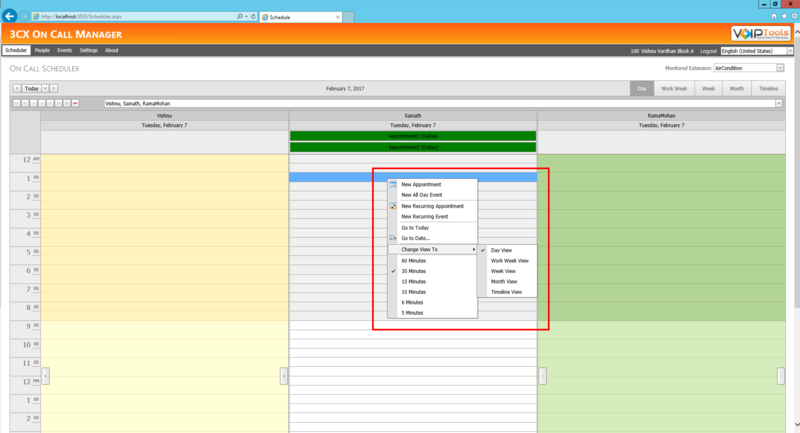 In the Scheduler tab, on the left side of the ‘Calendar’ header, click the Today dropdown to access the calendar. 2. Select the date on which you want to create the appointment. 3. From the ‘Visible Resource’ header, click appropriate ‘Visible Resource’ button, you can select appropriate agent(s) to display on the scheduler. 4. 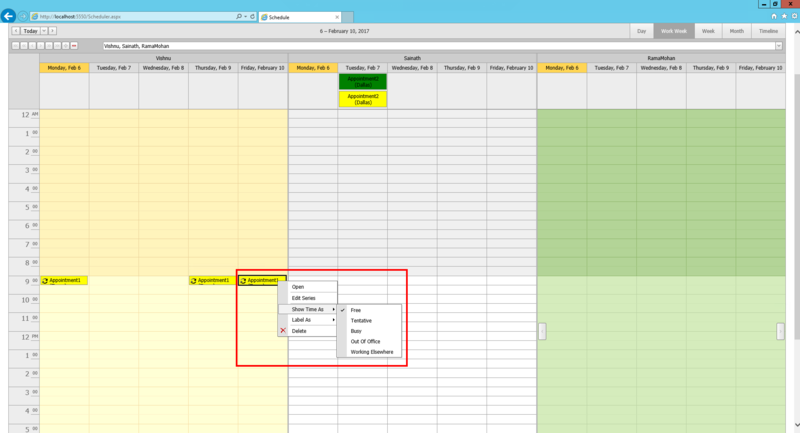 In the grid, and in the block that matches your required date and time, right click your mouse. 5. In the context menu, click New Appointment. 6. In the Untitled-Appointment box enter appropriate information in all the fields. 7. Click OK. Appointment is created for the agent. 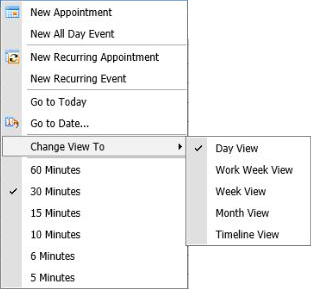 Opens Appointment dialog box with Recurring box checked. 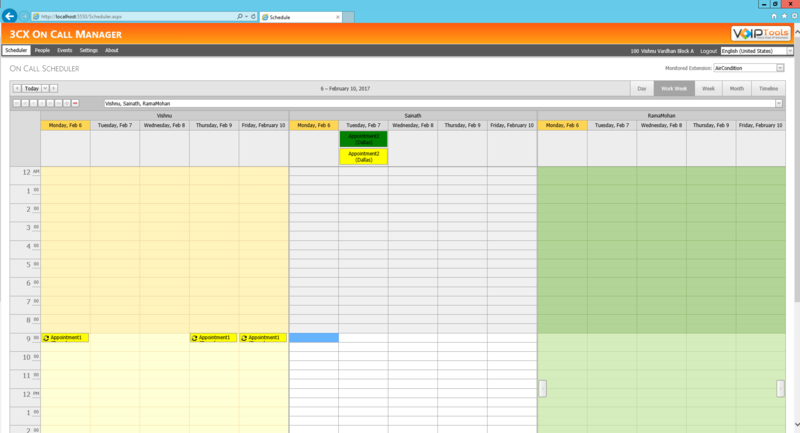 Opens a submenu that enables you to view the Scheduler screen in Day, Work Week, Week, Month or Timeline format. Enables you to view the Scheduler screen that divides the grid to show time interval in terms of 60 minutes. Similarly, you can view the grid in other time divisions like 30 minutes, 15 minutes, 10 minutes, 6 minutes or 5 minutes. The Appointment box enables you to schedule a new appointment for a specific agent. If Show time as is for the complete day, then check All day event box. 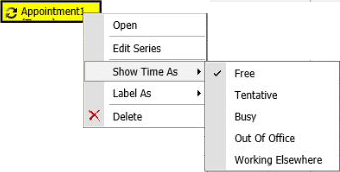 If you check this box, you will observe that the time selection box (from ‘Start time’) will disappear. Select the agent from the dropdown for whom you are creating the appointment. Check this box if you want to remind the appointment to the agent. You can select the time from the dropdown so that the agent receives the reminder message after the specified time. If you want the appointment to recur, check the Recurrence box. From the available options select appropriate value (Daily, Weekly, Monthly, Yearly, Every—day(s) or Every weekday) for the appointment to recur. Select this option if you do not want to stop the recurrence of the appointment. Select appropriate number from the drop down so that the appointment recurrence will occur for the specified number of times. Select this option and select appropriate date from the ‘Date’ drop down so that the appointment recurrence will end by the specified date. 1. In the Scheduler screen, from the ‘Visible Resource’ header, select the resource for which you want to edit the appointment. 2. In the grid, select and right-click the appointment that you want to edit. ‘Edit Appointment’ context menu appears. 3. Select appropriate option from the context menu to open the appointment. 4. Edit the appointment in the required fields. 5. Click OK to save the changes you made to the appointment. Edits Show Time As for the selected appointment as Free, Tentative, Busy, Out of Office or Working Elsewhere. Edits Label As for the selected appointment to the desired escalation level. Enables you to delete the ‘Series’ or ‘Occurrence’ of an appointment. 1. In the Scheduler screen, from the ‘Visible Resource’ header, select the resource for which you want to delete the appointment. 2. In the grid, select and right-click the appointment that you want to delete. 3. In the Confirm Delete message box, select The Series option if you want to delete all the occurrences of the recurring appointment or, select This Occurrence option if you want to delete only the present occurrence of the appointment. 4. Click OK to delete the appointment (series or just present occurrence, which ever option you have selected). The Events screen enables you to view the call logs of all the ‘On Call’ events for all the monitored extensions between the agents and the customers. The details of every event include date/ time, caller extension, caller name, action, notification type, monitor extension and the notes. Did you download these FREE 3CX add-ons yet? This FREE utility enables your customers to enter their phone number on your website, and receive an instant call back from you. This FREE utility monitors 3CX simultaneous calls in real-time, graphs utilization over time, and emails warnings.